When Bruce and Carmel Murdoch loaned their beautiful piano to the Museum, it was the start of a new era of museum presentation. Every day we endeavour to provide a pianist for visitors enjoyment. Each has their own unique style and plays a wide variety of music adaptable to age needs. Visitors can enjoy tunes from World War 1 right up to present day hits, or request their favourites. Ed was born in Gympie but spent most of his childhood years at Owanyilla. Most of his family learned to play the piano. He had lessons from Miss Turner while he was a student at Mungar State School. 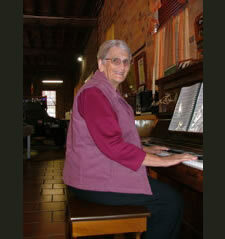 Miss Turner came from Gundiah by train and the lessons took place in the teachers house on the school piano. 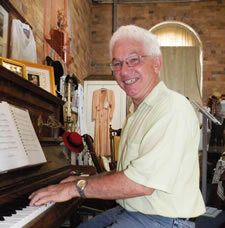 As a fifteen year old Ed played with the Maryborough High School band. Ed's music was fostered and developed by the church but he also learned to play old time dance music. During the 1960s he played for balls and dances in the local area. In 1971 Ed Moved away to work in Gladstone, where he met and married Barbara. By the end of the 70s he was again playing for the church and balls and dances. Ed played for his last dance in Gladstone in 1997 and returned to study at Central Queensland University. He completed a Batchelor of Education degree. Employment opportunities took Ed to live in Longreach and eventually back to Maryborough in 2007. When he discovered a need for pianists at the museum he became a volunteer. Ed believes that everyone has something to contribute to the local community. With his music, Ed feels that he is giving something back. He has enjoyed music all of his life and is rewarded with the camaraderie and friendships that he draws by being a volunteer at the museum. Be it only as a musician. 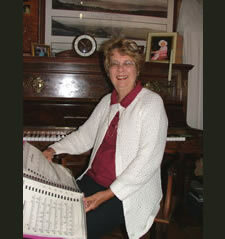 Mary began learning piano at about 8 or 9 and has no formal qualifications, she is always playing for pleasure. When her new husband Herb started work as Shire Clerk in Miriam Vale, Queensland, Mary was asked to play for the church and Sunday School. Then again, when he transferred to Gin Gin, they became heavily involved in the social life of the area and Mary played for her church and local concerts. She is still a church organist in Maryborough and although now having no piano at home, she plays voluntarily for organisations, as well as our museum. Carolyn started her musical career playing for St. Columbus' church at Maryborough on a pedal organ and later playing contemporary music at night in church during the 60s and 70s. In the 60s Carolyn performed for Maryborough radio station 4MB in a 4 piece band called the 'Red Robins'. Later, husband Glen joined with his guitar, the band being called 'Touch of Brass'. They played for balls and weddings and the Hockey Association 250 clubs up to the early 1980s. Carolyn hadn't touched a piano for 9 years previous to the opening of the museum, when she was asked if she would play. She thoroughly enjoys playing her music and meeting all the people who pass through the museum.